Notches and Quivers: Oh, Arrow, no! NOOOOOOOOOOOOOOOOOOOOOOOOOOOOOO!!! That was just... no. Not alright. Not alright at all. That was the best Arrow episode in a while and I now have high hopes for the other three eps in this multi-part finale. If this is less coherent than usual, it's the feels. As usual, the main plot of this episode was the least interesting. So far Roy's mirakuru story has never felt more than a convenient plot device and somehow I'm just not that invested. I like Roy, and I liked Roy and Thea, but this whole "grrr me Roy" thing isn't working for me. What do you want to bet that cure will come just in time for Roy to have it out with Slade and kill him? In some ways this episode was all about Moira and the things she would do for her family. We already know the answer to that: anything, but showing a more motherly side to her this episode worked well to garner empathy. She would have quit her mayoral race, she almost dropped a city on people to keep them safe, her choice to stand up to Slade was well duh. And it's important that she made the choice for Oliver, because he wouldn't have come back from this one. That ending slayed me. In way it was employing the fridged woman trope, but at the same time they handled it much better than I expected (because Shado). Hopefully that will continue. And whatever happens next will be overshadowed by Moira's sacrifice, which is one of the recurring themes of this show. Tommy died in a similar way (saving others) and that helped convince him to change his ways. I wonder what this will bring. I'm sad that they chose to kill off Moira, though. She was one of the best characters in this show, and a pretty unconventional mom for TV. There were also so many more stories they could have told: Mayor Moira, her giving Felicity a bit of hell because she told Oliver her secrets, taking back her company, dammit. I kind of wsh Slade would have walked away. Also, Oliver needs a break. And a hug. How awful must it be to watch both your parents die in horrible ways? Specifically so that you could live. This was a fairly big episode for Sara as well. They've done a wonderful parallel between Sara's coming home and Oliver's all through the season. I think she's finally at the point where she can also change the way Oliver did. As she pointed out herself they both need someone to be their light. Oliver has Felicity and Dig - and she does too, to some extent. But really, Syn is Sara's Felicity. I love everything about their sisterly relationship. (Also notice how it works in all the ways Laurel and Sara's doesn't.) I'm also curious about the old friend. Barbara Gordon, anyone? 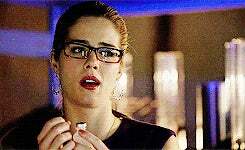 Felicity continue to be amazing, and her best moment this episode wasn't even a line, but her reaction to Oliver's ridiculous lidocaine injection (she's afraid of needles, too so she gets major props for just handling those). Dig's line about "no force in this world that can make you a bad person" smells of foreshadowing and I don't like it. Dig was pretty awesome this ep too. Poor thing keeps getting knocked about. And he isn't Oliver. Hopefully these two get more to do in the next few eps now that we're back to the core team. Is this the first ep without the opening narration? Pre-island Oliver is the worst. The promo for next week look amazing, and it looks like Oliver will finally tell Thea about him being the Arrow. Or making it public. Or he's just talking to himself again. I am excited!